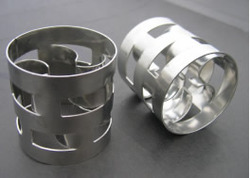 The range of Pall Rings we offer in the market are mechanically strong and highly versatile. Our team ensures that these products conform to the industrial standards. These products find application in various industries such as Water Treatment Plants. Our products facilitate various separation and absorption applications at atmospheric as well as low pressure, steam stripping, H2S, NH3 & SO2 Absorption & Stripping, for Quench Towers and direct contact cooling.